Industrial food production contributes heavily towards climate change, environmental degradation and the depletion of natural resources – and in so doing it erodes the very basis of agriculture. We urgently need to innovate our way out of this agrifood crisis, but we have to be clear about the kind of innovations we want. 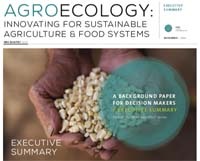 In this new background paper for decision-makers, Friends of the Earth International explores a systemic change of our food and agricultural systems based on innovations in agroecology, a proposal that is rapidly gaining ground worldwide. 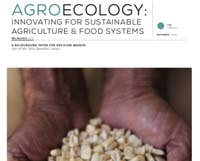 A growing body of scientific evidence shows that agroecology innovations and practices are technically feasible, affordable, politically, socially and culturally acceptable, adaptable to local circumstances and environmentally sound. These practices are rooted in ancestral and customary knowledge and practices of peasants, indigenous peoples and other small-scale food providers and many have already been successfully tested in farmers’ fields. Friends of the Earth International warns for the dangers of embracing the wrong kind of innovations; false ‘solutions’ such as ‘climate-smart agriculture’ and ‘sustainable intensification’ do not alter the power structures of the industrial food system. Instead of feeding the world in a healthy and sustainable way, these agribusiness-spurred ‘innovations’ are part of a business-as-usual approach that will only deepen the agrifood crisis, jeopardizing the livelihoods of urban and rural peoples, particularly workers and small-scale food producers around the world. To prevent false ‘solutions’ from dominating policy agendas, it is crucial for decision-makers to have the right information to guide their choices. This paper therefore presents a set of evaluation criteria with which to assess whether an innovation is socially, culturally, environmentally, politically and economically acceptable.